The fatal Uber crash in Arizona has the auto industry examining self-driving tech's shortcomings. 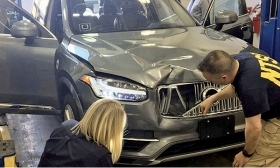 SAN FRANCISCO -- Uber has shut down its self-driving car operations in Arizona two months after a fatal crash involving one of its vehicles, the company said on Wednesday. Uber Technologies Inc. is not shuttering its entire autonomous vehicle program, a spokeswoman said, but rather is focused on more limited testing in Pittsburgh and California. The ride-hailing company had suspended its self-driving program in Arizona and elsewhere after one of its SUVs hit and killed a woman crossing the street in Tempe while operating in autonomous mode, marking the first fatality involving an autonomous vehicle. After the accident, Arizona Gov. Doug Ducey ordered Uber to stop operating on the state’s roads indefinitely, calling the incident "an unquestionable failure." It was a prompt about-face for a governor who has embraced experimental autonomous vehicle testing in his state. Uber hopes to resume testing in Pittsburgh this summer. The company has said that in the near term it wants to keep its autonomous testing near its engineering offices to help avoid future incidents. Its self-driving group is based in its Pittsburgh. Axios first reported Uber’s plans to dismantle its self-driving testing operations in Arizona.